Funny, and they laughed at community organizing! Don't bother the GOP has become too old and stale...to get popular on the internet. progressive change seems to be the significant request to conservatives in the republican party at this time. in other words, they need to be more liberal. It's going to take more than the internet to rebuild the GOP. Maybe they should oust the religious fanatics that have taken over the party, that would be a start. 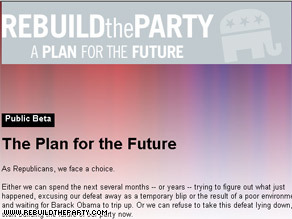 by the time the GOP use this model, Obama will have a new model to win with in 2012. They could use the internet while riding the Jesus Horses. Do they beleive in the internet? They'd be a lot better of if the adopted his message! Inclusion not legislated religious ideals. Too many old people in the RNC to appreciate the "interwebs" or those "series of tubes"
Obama Ran Such A Successful Campaign It Will Be The Standard Model For Every Election For A Generation. The Republican Party Wont Win Until They Become More Diverse! They Wont Become More Diverse Until They Get Rid Of The Far Right Neo Cons! This is hilarious! I agree, the online community organizing approach was a joke to them during the election, now they want to adopt those practices. One advise, Guys. DO NOT be COPYCATS ... do something original. It's a good move, and it might pay some dividends. But unless the party moves back towards the center and stops pandering to the religious right, all the technology in the world won't change the outcome. I really figures that republicans/conservatives would call it a "war", this shows the mentality here...the main thing being Americans have no real NEED for each other as in other cultures, where susbsistence and survival depends on cooperation...but I guess republicans/conservatives are too busy fighting...fighting social progressives and...each other! NO - DON'T CHANGE A THING!!! WE JUST NEED MORE AMERICAN HEROS LIKE -– HANNITY, RUSH, -– AND OREILLY -– TO TELL US WHAT TO DO!!! NEXT TIME -– WE WILL BEAT -– THOSE, DIVERSITY -RIDDEN, OVER EDUCATED, -– PEACE LOVING, -– ANTI WAR, LIBERALS!!! They forgot that Republicans are not interested in progressive ideas. They like to take the USA backward...it's the Grand Old Party. Old ideas, old concepts, old slogans (e.g. Dems are the "tax and spend" party). Regarding the latter...even though Clinton created a surplus, they still use that old tired slogan, hoping that no one will notice that they have become the "borrow, spend and let the next generations pay it off" Republican party. What irony! After the reactionary Republican wing made fun of Obama as "community organizer;" they embrace his methods. What idiots! Welcome to the age of the Anti-Christ. Just wait 48 months and we get it all back... See Carter 76... the Dems will implode... they always do! fellow GOP's, I guess it easier to just join the DNC then you get the complete package. The entrenched Repub conservatives are talking about getting back to basics, calling up Reagan, when what they need to do is look ahead if they expect to be a force in the 21st Century. Reaganomics is over and so are most of the ideas from 20+ years ago, including the way to energize the base and get more people invovled. They laugh at community organizing but that's precisely what got Obama into the WH. -Guess Sarah Palin, the RNC and others are eating their words about community organizers. Funny, I guess they are not mocking community organizing now.